"We often read about African forests in popular media, but it is books like this that set the stories straight, providing insight about experiences, knowledge and interaction based upon the realities of local people and their experiences. If you wish to understand African forests, particularly with a view to global environmental governance approaches, then this book will be an important read." - Jeff Thurston, Vector One. "A valuable work not just for a narrow audience interested in African forest policy, but for all individuals interested in Africa or development policy." - B.D. Orr, August 2010. 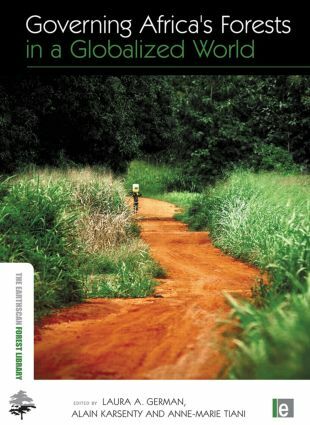 "Provides an excellent overview of the main challenges in forest governance in contemporary Africa as they are perceived by those involved in seeking to improve it." - The Journal of Biosocial Science, 2011. Foreword. 1. Forest Governance and Decentralization in Africa: Linking Local, Regional and Global Dialogues. Part I: Governing Africa's Forests in a Globalized World: Framing the Dialogue. 2. Forestry and Democratic Decentralization in Sub-Saharan Africa: A Rough Review. 3. Elusive Meanings: Decentralization, Conservation and Local Democracy. 4. The New Economic 'Great Game' in Africa and the Future of Governance Reforms in the Forestry Sector. Part II: Decentralized Forest Management: Forms and Outcomes. 5. Forest Sector Reforms, Livelihoods and Sustainability in Western Uganda. 6. Hidden Harvest: Unlocking the Economic Potential of Community-Based Forest Management in Tanzania. 7. Gendered Representation and Participation in Decentralized Forest Management: Case Studies from Cameroon and Senegal. 8. Forest Revenue Decentralization and Profits Redistribution in the Democratic Republic of Congo. 9. Governance of Decentralized Forest Revenue in Central Africa: For Better or for Worse? 10. Local Government and Forest Resource Governance in Mali: Taxation and Decentralized Management of Forest Resources in Siby Rural Commune. Box C: [S. Africa Inlay], 'Governance of Multi-stakeholder Forested Landscapes: The Case of Tree-Water Interactions in South Africa.' 11. Decentralization Outcomes in the Context of Political Uncertainty in Zimbabwe: A Comparative Assessment of Co-Management and CAMPFIRE and Implications for Policy. 12. Bridging the Gap between Environmental Decision-Makers in Madagascar. Part III: International Trade, Finance and Forest Sector Governance Reforms. 13. Trends in Ghana's International Timber Trade: Implications for Local Livelihoods and Sustainable Forest Management. 14. Forestry Governance and Trade Transformations: Experiences from Tanzania and Implications for Sustainable Development. 15. The African Forest Law Enforcement and Governance (AFLEG) and Forest Law Enforcement, Governance and Trade (FLEGT) Processes and the Challenges of Forest Governance in African Tropical Timber Exporting Countries. 16. Free, Prior and Informed Consent: Implications for Sustainable Forest Management in the Congo Basin. 17. On the Nature of Intergenerational and Social Networks in the African Forest Sector: The Case of Chinese, Lebanese, Indian and Italian Business Networks. 18. Climate Change: What are its Implications for Forest Governance? Part IV: Conclusions. 19. Forest Governance and Decentralization in Africa: Issues and Emerging Trends. Index. Laura German works in the Governance Program of the Center for International Forestry Research (CIFOR), Indonesia. Alain Karsenty works for CIRAD, the French research organisation for rural development and forestry, in Montpellier, France. Anne-Marie Tiani is an independent consultant affiliated with CIFOR and the African Model Forests Initiative.